Cervantes has always been a hub to catch upcoming superstars before they try to sellout shows in arenas. For Amine (uh-ME-nay), this was his second major tour and his second time being in Denver. For his TourPoint5ive he brought along Pharrell’s protégé, Buddy to open for him. The two have both released 2 albums and have made a huge splash on the hip-hop/rap scene since 2016. 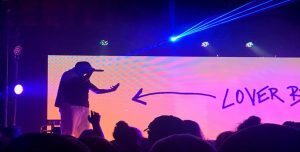 Amine announced the tour after the release of his second album ONEPOINTFIVE, which is supposed to be an allusion to this being the rapper’s 1.5 album and not his sophomore album. Buddy’s Harlan and Alondra was his first full length debut album and got a 7.4/10 from Pitchfork magazine. Unlike his tour mate, Amine’s album was not received very well by pitchfork but that didn’t impede the artist who went quadruple-platinum from his smash single “Caroline” from headlining the tour. 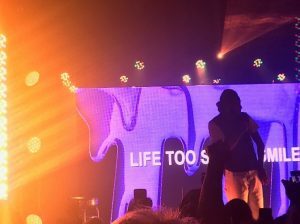 Buddy opened with some of his well-known aggressive energy by performing some of his biggest club hits like “Trouble on Central,” “Black,” and “Type of S**t”. Stirring up the crowd the whole time, the rapper at one point took it upon himself to Crip walk on the stage like he did at the Sydney Opera House. My personal favorite performances were the songs “Shameless” and “Trippin’,” which were some of the slower songs off the album. All in all, Buddy got the crowd wild and in their feelings at the exact same time setting up his counter-part for an eager audience. 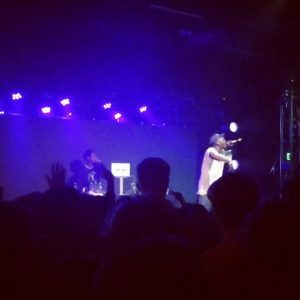 After he finished his first song, the rapper addressed the crowd giving them instructions to “make them feel beautiful” the whole time. The rapper would shout the phrase “you’re beautiful” and the crowd would echo back “I know” as many times as Amine saw fit. It was an interesting way of interacting with the audience to say the least but as an advocate for speaking things into existence, I was a huge fan. Even at one point, Amine chose to bring up a fan on the stage with him. The fan (whose name escapes me) was instructed to sign the rapper’s pants with his name and what he wanted to be in the future. The fan screamed into the microphone that he wanted to be a visionary, which struck me as admirable and extremely ambiguous at the same time. If you’re somehow reading this fan, I hope you accomplish all your dreams. Getting back to music aspect of everything, some of his most memorable songs from his set were “REDMERCEDES”, “Heebiejeebies”, “Spice Girl,” and “Wedding Crashers.” Amine even performed his smash hit “Caroline” but did it in an acapella fashion, which took me by surprise to say the least. The photos of Amine were taken by me but the photo of Buddy (guy in white shirt) was taken by Derek Slusser.